11’s and Planks. Thats It. THE SCENE: Tuesday 4/2/19 @ Blazing Saddle. Warm for the first time in a while. Maybe it was the 3 miles that Speaker made us run before hand. Yes and yes. Cant sue me. Easter is coming up. Don’t let the season pass by without thinking about the true meaning. The good news of Easter is that Christ came and took on our penalty for sin and we get his his position of Righteousness. The Great Exchange. YHC(Shoestring) organized the Crucible to be a trial of a mans endurance, stamina, mental, and physical strength and to see what kind of new creation comes out on the other side. 5 AO’s with a 20 minute bootcamp. 14+ miles of running. 1 amazing event. 15 pax circled up for the welcome and disclaimer. One of those pax was a FNG. Running support for the event was C-Lo and Zima. Greatest of T-CLAPS to those two HIM who helped make this event amazing. Without them, there is no telling how many pax would have not completed the event. Mosey to one end of the parking lot and started 11’s. Burpees on one end, Big Boy Sit-ups on the other. Plenty of running. At the end of 20 mins, the pax gathered together and began the ~1.8 mile trek to the Sandlot where Soulja Boy would take over on Q. Nature Boy and Four Eyes started off strong. YHC was not breathing well from sickness but had to push thru and felt a ton better than expected. The pax were overall in great spirits and were ready for the task at hand. 10 Merkins at the 50yd line. Bear crawl to the 35yd line perform 10 BBSU and crawl bear back to the 50. 10 more merkins at the 50 then bear crawl to the 20 (stoping at the 35 for the BBSU) and perform 10 squats and crawl bear back to the 50. Totaling 70 reps, 45 yds of bear crawl, 45 yards of crawl bear. Next PAX partnered up and finished off with some Doracides. 100 Merkins, 150 BBSU, and 200 squats using the same distance for suicide sprints. TCLAPS to C-Lo for for jumping in to even out the number of PAX. Altar Boy decided to do something crazy. He made the pax run more after running. Why would someone do that? Great question. Altar Boy put us through the Blue Mile. Total 40 reps of each exercise and 1 Mile. O Positive was our Q at the Bermuda Triangle. you never know what’s coming with the swirling snakes of OP, but this was plain foolishness on a wall! The smackdown was laid and YHC was in pain. This is where the test of the pax really came through. The next leg was the longest distance of running for the day. 6+miles from the Berm to the Blazing Saddles. YHC made it about 150 yds and realized my knees and lungs were not going to cooperate. I had to tap out of the event and call it a day. YHC hopped in the car with C-Lo to run support. Set 1: Merkins, BBSU, Squats. Set 2: Alternating Side Merkins, Flutter Kicks, Lunges. Set 3: Werkins, WWI Situps, Monkey Humpers. Crucible- a situation of severe trial, or in which different elements interact, leading to the creation of something new. This event was made to be a trial that the pax could test themselves and come out a new creation. This definitely tested some of the pax. 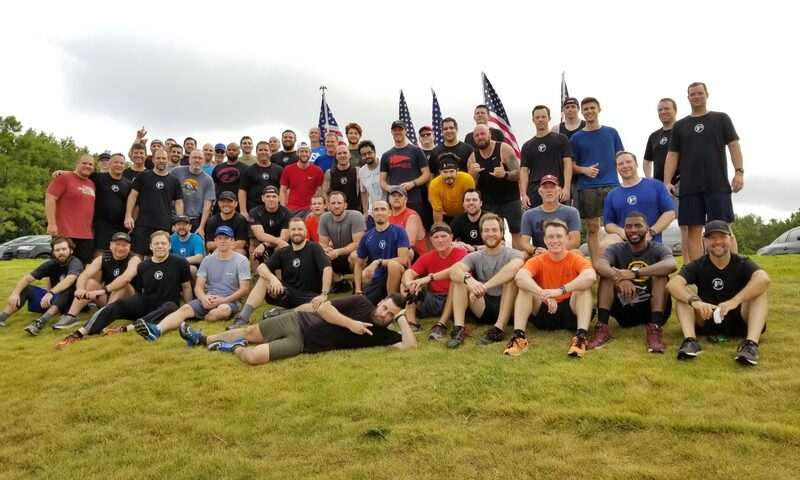 It was hard and YHC was proud of the pax that completed the event. I was amazingly proud of how far the FNG(Bobsled) made it in the event. Regardless what each individual pax learned about themselves in the event, there is a reality that life is one giant Crucible. A trial that leads to the creation of something new. As believers, our hope is in Jesus that He endured the ultimate crucible on the cross so that we could be made into something new. Never forget that sacrifice and that we have a mediator in Jesus. He is our everything. This was an amazing day for F3 Memphis and YHC can wait for the fall when we do this again. Prepare now for the fall. Crucible is coming again. THE SCENE: 43° mostly clear with semi-gloom. Where’s U-Rock? Came in super hot especially with all that PLC onboard. This is free, and I’m ok at this, so don’t hurt yourself. SSH x 10 IC while waiting for U-Rock to join us. Team up. While Team 1 is doing the 1-2-3-4-5, Team 2 Bear Crawls down one stables aisle and back up the other (called Omaha and switched to BC down aisle, run rest of way around. Still beastly enough). Mosey back almost to startex. Bear Crawl last 30 feet for good measure. Being content doesn’t mean we shouldn’t have dreams for the future. But as we plan, set goals, and work toward them, we need to live in the present with a sense of peace and gratitude. Instead of speaking want, develop a habit of focusing on what you are grateful for in the moment. Thank God for his goodness, for your health, for your family and friends, for the ability to work and create income. Thank him for giving you another day of life and a purpose to fulfill. If you’ll simply start looking, you’ll find countless things to be thankful for. Think about those things. Talk about those things. Let your subconscious hear your grateful words so it can, in turn, foster more opportunities for gratefulness in your life. As you begin working these practices into your day, you will start seeing all you have to be grateful for with fresh eyes. Your heart will begin to shift toward an appreciation for the good in your life, and your words will reflect that shift. PRAYERS: Billy Blanks prepping for Nursing Finals and with passing score will be taking a job at LeBonheur. How come nobody ever told me we had an open invite to the Pancake Breakfast at Pickering Center for Old Folk? THE SCENE: High 30s. Low 40s. We are fully known by God. Whether you are in the peak or valley of life right now, God is there and loves you. URock floated out an idea last night to prerun. Kudzu thought this meant URock talked to me and there wouldn’t be much running. Kudzu was wrong. Great work by everyone. T-Claps to Sparky’s M who EHed FNG Flipper after seeing him rucking around the neighborhood. 5 sprints fence to fence. Read the lyrics to “Thou Oh Lord” which is derived from Psalm 3. We all get tired but know that if you are a Christian that the Lord is the lifter of your head. We must honor him and know that He will take care of us when adversity hits. Great to have some banter during the workout. Thankful for you guys who have encouraged me and push me. Keep posting. Crucible in March. THE SCENE: Clear skies with a little chill in the air. Attempted to finish the merkin-ish mile. We got 3/4 of the mile completed before time was up. 32x curb merkins (aka curb humpers) 3 reps per curb–> move to the next curb for 3 more and so on. 8 curbs total got humped real hard. Never underestimate the power of a simple smile, a kind word or the acknowledgement of another. Little gestures can move mountains. 4(1 FNG: ‘kilo’); Watchita, Speaker, U-Rock and O Positive (YHC). Be bold. Be courageous. Be submissive to the Lord and surrender your plans to Him. Let Him take care of the rest. We got smoked. Demanding on the whole body. PAX kept moving and finished strong. Pretty simple: 4 exercises and bear crawls. Try it some time. THE SCENE: The Saddle – 49° with steady wind. Super 21: Round 1=1/1, Round 2=2/2 etc…21 dips after each set of rounds. Valentine’s Day is obviously a silly commercialized day with a name. But even if you and your wife could care less about this day (like my wife and I) it can still be useful as a chance to do something special for each other that shows your love and appreciation. In the past we have done next to nothing but after discussing it last night, we realized we are missing out on a good opportunity. Not only does it strengthen the relationship but by making the effort to value each other we model to our children important lessons about what a healthy relationship is. They are absorbing more than we realize. 231 reps of sit-ups and merkin variations made for some good pain and mumblechatter. Surprisingly no train burpees today. Good thoughts came up during PLC regarding adding another workout to the Saddle schedule. 2nd F lunch today at Las Delicias.